Parallel to the exhibitions ‘Field Work–part 1’ and ‘Field Work–part 2’ SMART Project Space launches a discussion aimed to address curatorial (and artistic) practices from the perspective of ecological thinking. Instead of focusing on the physical aspects of ecology – and herewith potentially directing the discussion toward issues of sustainability in the production, dissemination and presentation of art–the discussion centers on a ‘ecology of ideas’. In an economy of knowledge, ideas and images of immaterial ‘goods’, a dialogue on the sustainability of ideas could offer an much needed possibility to think (and work) differently within the curatorial framework. It might be a manner to avoid the problematics that arise with the labeling of exhibitions in terms of themes such as ‘migration’, ‘ecology’, ‘feminism’, and so on. All too often, even the most pressing and relevant issues addressed are quickly outdated by critics and curators (currently reflected in a tendency to dismiss engaged artistic and curatorial practices in favour of a ‘return of poetics and form’). The ‘Field Work’ discussion aims to articulate methodologies, critical strategies and ways of curating, from the perspective of ecological thinking in particular – in order to transcend the seeming disposability of ideas and themes. Code points out several issues defining an ecological way of gaining knowledge, in which interdisciplinarity and transdisciplinarity, an openly cooperative, participatory and relational approach, situatedness, a letting go of the drive toward mastery are some of the core elements. Within the ‘Field Work’ discussion a parallel is drawn between Code’s ‘ecological way’ of gaining knowledge and the field of cultural production, where the idea of artists (and curators) as knowledge producers is frequently discussed. One could in this case explore parallels between the current interdisciplinary perspective on ecology, and art production and curating as a cultural activity interwoven with other practices and disciplines, and could also look at artistic and curatorial practices characterized by systematically working on generating and processing knowledge of a particular subject and area of interest to ‘specifically locate’ projects. Another potentially interesting parallel can be found in Code’s statement that ecological thinking has a responsive character in relation to the historical and geographical diversity of the community, and relational art practices. The discussion aims to raise questions such as: What would be the necessity of ecological thinking in the field of cultural production? What difference could it make? What would be required to work toward an ecology or sustainability of ideas? What implications would that have for the social and economical structure of the art world? What would the overlap be with other critical curatorial strategies and epistemologies identified with the type of cognitive experience that is articulated in contemporary visual arts? These questions and this speculative text could function as a starting point for discussion. Visitors to the exhibitions ‘Field Work – part 1’ and ‘Field Work – part 2’ and online visitors are invited to publish their comments, suggestions and contributions on this forum. We are looking forward to a lively and challenging discussion. At the Royal Botanical Gardens this summer in Ontario I will be curating an international show of artists in a non-art venue (these are often the best) with Nils-Udo, Bob Verschueren, Roy Staab, Yolanda Gutierrez, Neville Gabie, Simon Frank and others. All sites are relevant including the site of the artist's book... This enables artists many ways of expressing ideas and providing forms for their intentions prior ro exhibiting or integration in environments. Minor tune-ups seem insufficient. Reforming curatorial practices to respect ecological integrity requires a major overhaul of our professional protocols. Because it necessitates the redirecting of curatorial 'flow patterns', this shift heralds a 'watershed' opportunity. Each modification helps realize the linguistic root of our profession. Curators 'cure'. They share this function with doctors whose therapeutic role is focused on matters of the body, and curates, parish priests whose therapeutic role is focused on matters of the soul. Art curators are not circumscribed by medicine or religion. They are at liberty to direct their therapeutic role to the functional well-being of ecosystems. How can curators promote a 'curative' relationship with habitat? Curators construct relationships between art works, articulate these relationships, and interpret their significance. 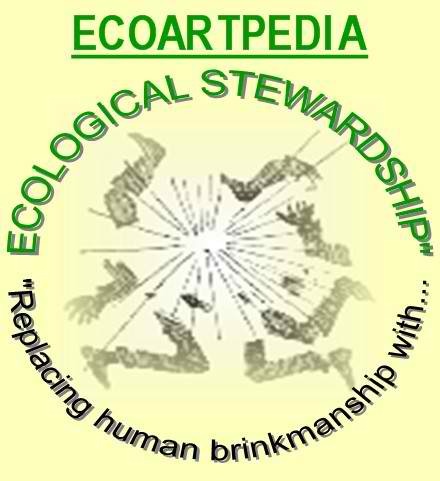 Curators can play a formative role in awakening ecological consciousness and instilling environmental responsibility. Their capacity to affect environmental change far exceeds selecting works of art that address ecological themes. They can activate these themes by actually adopting ecological models of organization into their professional activities. Structurally, eco systems are complex. 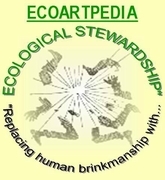 Formally, eco systems depend upon relationships. Temporally, eco systems involve momentary perturbations and evolutionary transformations. Some curators are already venturing across this threshold of opportunity, applying eco-reforms to the public presentation of art. Recently I attended the New York Antiquarian Book Fair at the Park Avenue Armory where around 200 antiquarian book exhibitors/180 specialties offered collectors and the public in general an opportunity to see first hand illuminated manuscripts, master drawings, rare books, fine bindings, and extraordinary maps and atlases. MAPS are of great interest. Why? Because they evoke for me the most famous statement by Korzybski: the elementary idea of a map as quoted by Gregory Bateson:"The MAP is not the territory"
As we enter this "Ecological Age""Ecological Age"(Thomas Berry) it seems prudent to differentiate which 'ways of ecological thinking' get onto the Ecological Art discipline map. In order to discuss the value of ecological thought to cultural production, how appropriate is speculation to advance the discussion and achieve some greater precision of the central problem posed here? Ecological inquiry implies a method per se. After World War II, an aggregate of ideas generated in many places gave origen to what today is known as communication theory, or information theory, or systems theory,from Bertalanffy (Vienna), Weiner (Harvard),Von Neumann (Princeton), Craik (Cambridge), Shannon (Bell Telephone labs) and so on. Among the problems they addressed they shared one question in common: what sort of a thing is an organized system (Whitehead and Russell-Theory of Logical Types)? In principle, the name is not the thing named, and the name of the name is not the name, and so on (i.e. a message ABOUT war is not part OF the war). Here we may find the beginnings of understanding complex systems, especially including the detection of patterns(e.g.,isomorphs). By following organized systems of ideas at the end of the 20th Century the WWW (World Wide Web) had sent 'information' all over and with it all the 'www's questions we can think of...where, what, when/who, why, which/and so on, to form eco-mental maps of whatever comes to our mind. These on-demand systems are being used in innovative ways by arts organizations arriving at creative experimentations and encouraging the interaction between artists and audiences. Environmental art fits in this category of art with a purpose based on societal and ecosystems needs See Rosi Lister-"What is environmental art?" It is appropriate therefore to clarify at this point that NOT all ecological artists are environmental artists. It is of critical importance for the development of knowledge to make distinctions with a difference. And this is an example to that effect. Let's assume for this discussion that at first glance there are three variables to be considered: the ARTIST with the society and with nature. And let's assume that instead of using relations, situations, inter-relations, trans-relations, interactions, linkages,as the starting point, we decide to COMBINE the variables to arrive to a particular mode of thought which we may call ecological. Of course, this requires a reconfiguration of the way of thinking and the adoption of new ecological models for arts organizations to support and embrace. As an example, I am now experimenting with an ecological concept/thought which I have coined video art haiku that permits me as an artist to leap into the abstract by combining nature (ecosystems) and eco-mental processes (poetic imagination) WITH ecological modes of perception/Time using video as the technological tool to create poems in motion. SMART Project Space has got the right idea. Rather than one off over- themed and over-hung exhibitions that jump into bed with complex issues, it is time to slow down to allow ideas, concepts and dialogues to develop. There isn’t a quick win solution to the issues at stake, and artists shouldn’t be made to feel part of a propaganda machine to fight climate change, so choosing to address the issues in a two part exhibition makes sense with discourse around it, between it and through it. This approach is necessary – we need to demonstrate an important investment into our thinking at a time when the world is moving more quickly than ever before and our time and energy (we are living in a 50-second concentration span culture) becomes absorbed by a never ending and evolving series of communication methods. Ideas need time to germinate and we need to be more inclusive and grow conversations and responses between disciplines, gender, age and cultures – artists and curators are positioned to nurture this way of thinking.